10 Biggest Client Enrollment Mistakes - Coach & Grow R.I.C.H. Good news… This doesn’t have to happen to you! 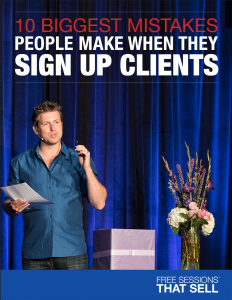 Here’s a special report and video from my friend and coaching business expert Christian Mickelsen on the 10 biggest mistakes people make when signing up coaching clients. mistakes than I would like to admit… especially #1 and #8….